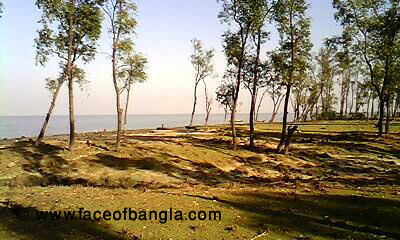 Hatia is a large Island and an administrative upazilla of Noakhali district. Visitors can get village life, traditional coastal life and can enjoy the wild life sanctuary in Nighum Diwp. Nijhum island is famous for wild deer. Two ways can be used to reach in Hatia Island. 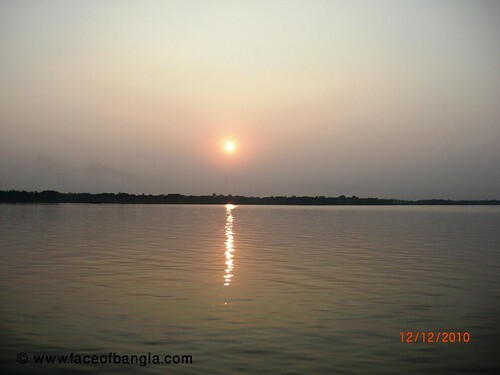 The most comfortable one is by launch from Dhaka Sadar Ghat. 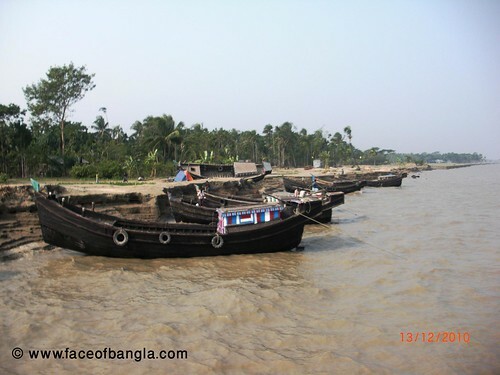 It takes almost 12 hours to reach in Hatia Island from Dhaka. 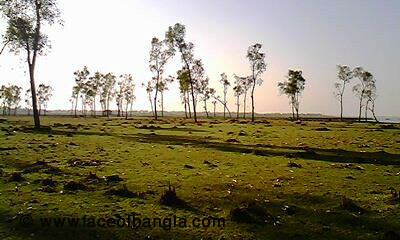 The second way is to go Sonapur, Noakhali from Dhaka by bus. Then you have to hire CNG run vehicles to go to Chairman Ghat. 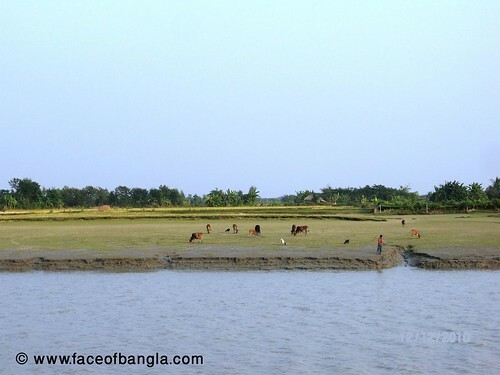 It takes 5 hours from Dhaka to Sonapur and 1 hour from Sonapur to Chairman Ghat. There are sea truck, launches, and engine boats to cross the sea to reach Hatia Island. Sea truck and launch are available only from 11.00 a.m. to 3 p.m. depending on tidal ups and downs. If you choose this second way, you can reach Hatia within 9 hours and will be landed on Nalchira Ghat in Hatia. 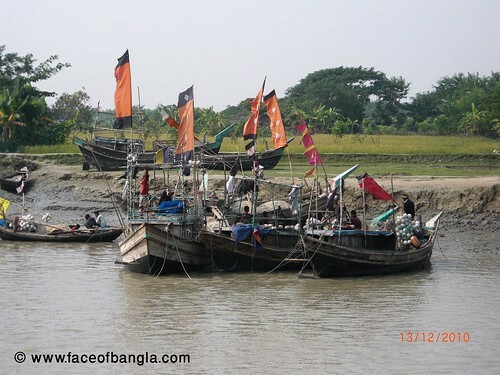 On the other hand, the launches from Sadar Ghat anchor at Tamuroddi Ghat in Hatia. 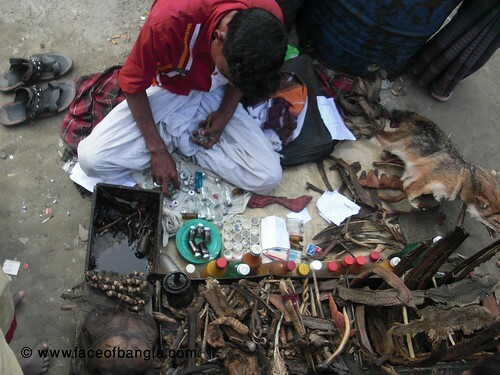 This people collects the most strange and anomalous objects from the nature such as some rare wild animal’s leather, skull, bones, teeth, feathers, wings, some kind of plant or animal oils etc and showcase those things in a village market place to enchant the others and thus he earns his lives. These types of pupil in the village and in other remote locality are now very rare because of the anti superstitious campaign through literacy movement. 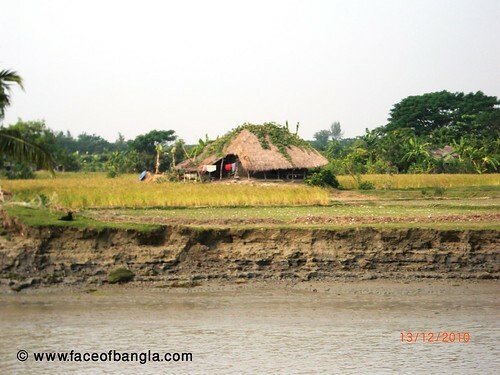 This photo was shot at Chairman Ghat, Noakhali on the way to Hatia Island. Hatia is a long Island. It is wide in North to South and is about 50 km long. This Island’s width is not more than 15 km. It is the island with a huge amount of population. Upazilla Sadar is located at Ochkhali area. There are two residential hotels in Hatia named Hongkong and Bankok. The visitors who want to visit Nijhum diwp have to go Jahagmara, at the very end of Hatia towards south. 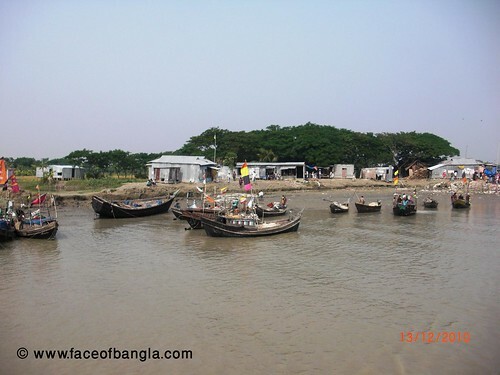 Then you have to cross the river channel by boat to reach Nijhum diwp (Island). In Hatia, you can go Kazir Hath from Ochkhali by Rikshaw and other motor vehicles. Kazir hath is the eastern part of the island. 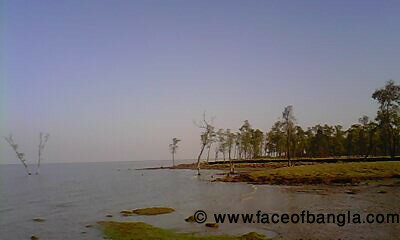 You can enjoy the sea shore, Badi Badh (Dam) and man made forest in the area. Cautions: Try to avoid engine boats from Chairman Ghat to Nalchira Journey. Because some boat owners have collaboration with the sea robbers. Sea robbery often takes place in this route. Do not stay in the shores and forest of Kazir Hath at night. Many fishermen and native dwellers in the char area of Hatia are associated with robbery. collaboration with the sea robbers.